Welcome to the Abernathy Family Reunion Website. This website is the official website for the relatives of George (1853-1943) and Manerva (1855-1948) Abernathy of Linden, Alabama. George Abernathy was the son of Jacob (Jake) Abernathy who was born a slave in 1823 in South Carolina. This website will serve as our means of communication as we prepare for all Abernathy Family Reunions. This website will also serve to enable us to connect and reconnect family with family throughout the year. Therefore, please join the site. It is free. Go to the member profile, find your name, and follow instructions to join. If your name can not be located, go to the top icon, click on contact us, and let us know. We will make the correction. Upload family photos and information you deem important. Remember, you can e-mail family from this site as well as take the family poll and quiz etc. Also, be sure to have everyone you know in the family join the site. Our goal is to celebrate family and praise God for the bountiful blessings he has bestowed upon each and every member. Therefore, be sure to take the time to browse the site. As you know it is time for all Family Reunion Chapters to send the SEED MONEY to the Daytona Beach Chapter. 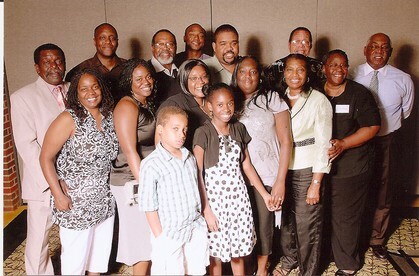 They are hosting the 2019 Abernathy Family Reunion in Daytona Beach, Florida For those individuals new to the reunion, please go to the top on the left, click on and read " Funding the Reunion"
It is also time to meet with your chapter to make sure they are beginning to plan to attend. Tell everyone you know when and where the reunion will take place. We hope to see everyone in Daytona Beach, Florida. Please write in the memo section of your check, Abernathy Family Reunion. Chapter Seed Money or CSM. Again, it is time to set aside your contribution to families helping families. As you know, we wish to have as many families with children attend the reunion in order to continue this wonderful family reunion tradition. In order to do so, we send our contribution of $100 into the host reunion chapter to help reduce the cost of the registration fees. So we are looking forward to as many families as possible sending in their $100. For those individuals who are new to the reunion, please go to the top left, click on and read, "Funding the Reunion"
Send your FAMILIES HELPING FAMILIES MONEY to Pamela Douglas at the above address. Please write in the memo section of your check, Abernathy Family Reunion - familes helping families or fhf. As we approach The 2019 RDA Breakfast Celebration, (today is March 9, 2019) - I would like to thank those who have assisted in making this worthy event a success. Thank you to: Larry and Regina Abernathy, Elizabeth D Abernathy, Donald and Gloria Outland, Greta Abernathy, Solvenia McCormick, Susie Hildreth, Bernis and Cynthia Abernathy, Athalee Anderson, Aretha and Winston Muhammad, Hazel Franklin and William and Carletta Abernathy, Pastor and Mrs. Raymond Coats, Dr. and Mrs. Randy Howard, Mr. and Mrs. Juian Abernathy, Greta Abernathy, and Mrs. Hazel Franklin. Thank you again from the bottom of my heart. I pray this effort will be a catalyst to keep Ralph D Abernathy in his rightful place in the history of the Civil Rights Movement. Also,if any other family members would like to contribute to this cause, there is still time. 2019 Ralph David Abernathy Civil Rights Breakfast Celebration A Success. This years RDA Celebration Breakfast was indeed a sucess. I just want to thank our family, The Abernathys, for your continued support of the RDA Civil Right Breakfast Celebration. We had a excellent turn out and the Abernathy Family was well represented, including the presence of Aunt Susie Hildreth. Looking forward to seeing everyone in Daytona. Ralph David Abernathy Scholarship Recipients. Each will receive $302.00 by the first of the year. We are so very proud of our family members! Some donors did not contribute $60.00. Some contributed various amounts ranging from $5.00 to $100.00. This is being stated to explain the grand total of $1,810.00. If there has been an oversight on my part, please contact me immediately. My husband, Leslie Hagan-Morgan is running for California State Assembly, district 59. We live in Los Angeles. So we would appreciate any contributions and/or volunteers to the campaign. You can visit his website for further information or to make a donation! Facebook.com/lesliehaganmorganforstateassembly Instagram: @lesliehaganmorgan Thank you all!